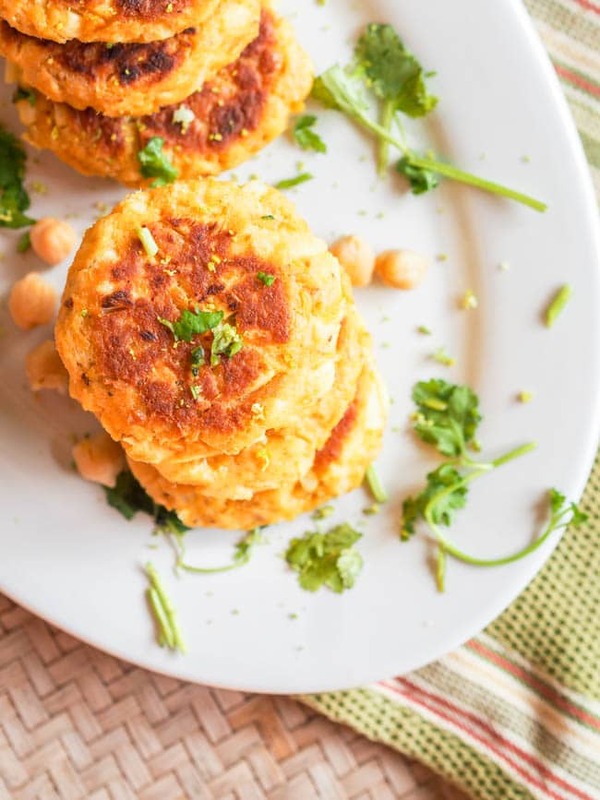 Super soft and delicious 30 minute seven ingredient canned salmon cakes with hearts of palm and chickpeas. A perfect gluten free and dairy free lunch or dinner. Serve with a home made Cilantro Lime Aioli for the ultimate flavor explosion. This is one of the most surprisingly good canned hearts of palm recipes. Remember how I mentioned that you can always find a jar or can of hearts of palm in the Costa Rican grocery stores? Well expect to be seeing a whole lot of canned hearts of palm recipes. First I started with a tomato hearts of palm avocado salad. Then I moved onto hearts of palm and quinoa stuffed avocado boats. And now I’m on to canned salmon cakes for this one of many more to come canned hearts of palm recipes. I love making all sorts of patties, from my all time favorite vegan veggie burgers to crab cakes. This is a fusion, a mix of both worlds. I wanted a bit of seafood, and a bit of hearty flavors. Canned salmon meets chickpeas and hearts of palm. The salmon provides that flaky and delicate fish quality. The chickpeas create a hearty firm texture for these patties. And the hearts of palm are a perfect imitation crab meat. Yep I said – hearts of palm = jumbo lump crab meat in this recipe. Have you seen the price on a pound of jump lump crab meat? It’s almost astronomical. And why spend all that money, when you can create a similar texture with chopped hearts of palm? I swear the chopped hearts of palm when mixed with the salmon and other ingredients give off a crab taste and texture. Don’t mince the hearts of palm up, just keep them a bit chopped. Instead of making the full mixture completely smooth, I wanted a bit more texture in each bite, so that you could really distinguish each ingredient from the others. These 30 minute gluten free canned salmon cakes with hearts of palm literally come together in minutes. 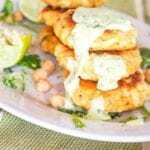 You only need seven ingredients – canned salmon, chickpeas, hearts of palm, lime, old bay and gluten free flour or breadcrumbs. I mixed everything together and added flour, but imagine gluten free panko breadcrumbs would add a nice light airy crunch to these as well. This is a perfect 30 minute weeknight dinner meal that is low fuss, one bowl and cooks in minutes. Definitely one of the canned hearts of palm recipes you’ll be coming back to over and over again. While the canned salmon cakes are sizzling up and browning, quickly whip together the aioli, made with mayo, lime, cilantro and olive oil. These canned salmon cakes are light and hearty with a creamy citrusy zesty sauce. In a large bowl combine crush chickpeas with a fork. Add salmon, hearts of palm, egg, 1 teaspoon lime juice, salt, old bay and flour. Mix until smooth. In a small bowl combine the aioli ingredients, lime zest, tablespoon lime juice, cilantro, mayo and 2 tablespoon olive oil. Mix until smooth. Form 6-8 round and flat patties out of the mix. Heat 1 tablespoon olive oil over medium heat. Once hot and sizzling add patties, making sure not to overcrowd the pan. Pan fry for a few minutes per side until browned. Repeat with remaining patties. Serve with a dollop of the aioli. I love hearts of palm, but seem to mostly eat them in salads. I love the idea of them in salmon cakes. Will be trying these. Thank you. These look amazing!! I can’t wait to try them! And the Aioli sounds so delicious too! Amazing. I’ve been wanting some salmon cakes. These look really fun! wow these look delicious!! Love hearts of palm and salmon, so these sound right up my alley. Thanks for connecting through FB! You have a lovely blog with very clean and excellent pictures Vicky!! Salmon Cakes look amazing, can’t wait to try them. If you want to use jumbo lump crab meat for the ultimate seafood cake that would be delicious I am sure! Or you could try using artichoke hearts instead! I love salmon cakes but I have never made them with heart of palm (another favorite). Nice idea and good photos. Thanks! It’s definitely a great combo! When I read the ingredients I was reminded of my late mother. Sometimes when my father wanted fish cakes but there was no suitable fresh fish available, she would use tinned salmon. Your salmon cakes look amazing! Thanks for sharing this. So glad to have brought up family memories for you : )) Even with canned salmon these are still delicious! this is a great use of the Hearts of Palm – I am sure that I have had a can in the cupboard for forever! Then you’ve got to dig it out and make these asap! Fascinating combination! It sounds delicious. 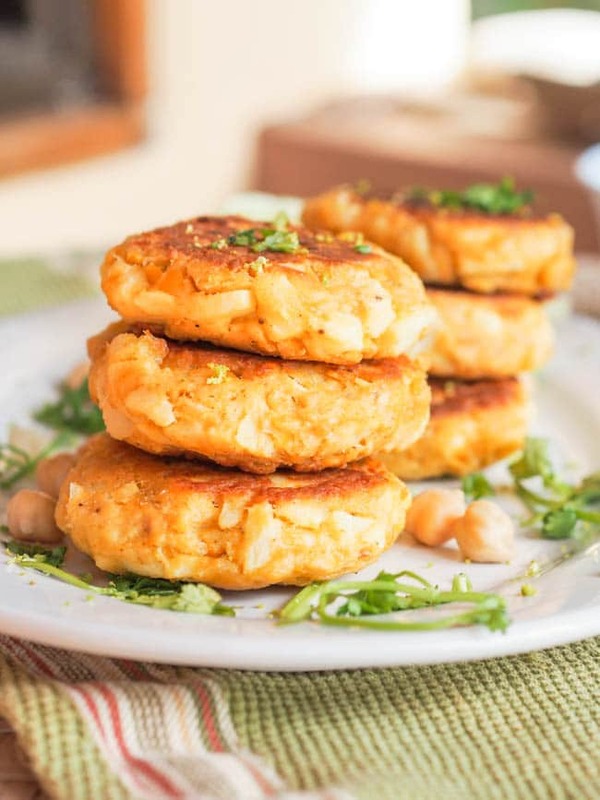 What a great idea to add chickpeas to the fishcakes! Love this, and they look so good! I’ve never cooked with heart of palm before but these Salmon cakes look and sound delicious! Look so delicious! I would love to try the recipe. It will be great lunch. Can you freeze them? Thanks! Yes I think these would definitely freeze well! So, confession time: My family eats heart of palm straight out of the jar. I never thought of cooking with them – I never have the chance to! These salmon cakes look amazing! I LOVE heart of palm, and I never would have thought to pair them salmon in a salmon cake! I can totally see how they would give off a lump crab type texture! I can’t wait to try this – BRILLIANT! I’m so excited about this recipe! Such a creative idea to include hearts of palm! I always have a can in the pantry! Thanks! You’ve got to try this if you’ve already got hearts of palm in the pantry : ) Such a great use of it! 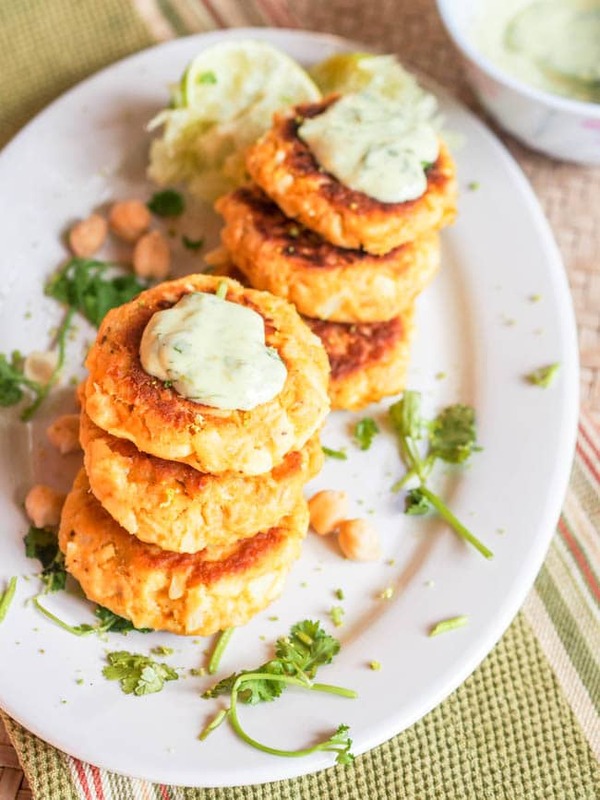 My husband adores salmon cakes and these look fabulous! Love the addition of the hearts of palm, they’re so yummy, I haven’t had them in simply ages and almost forgot about them! 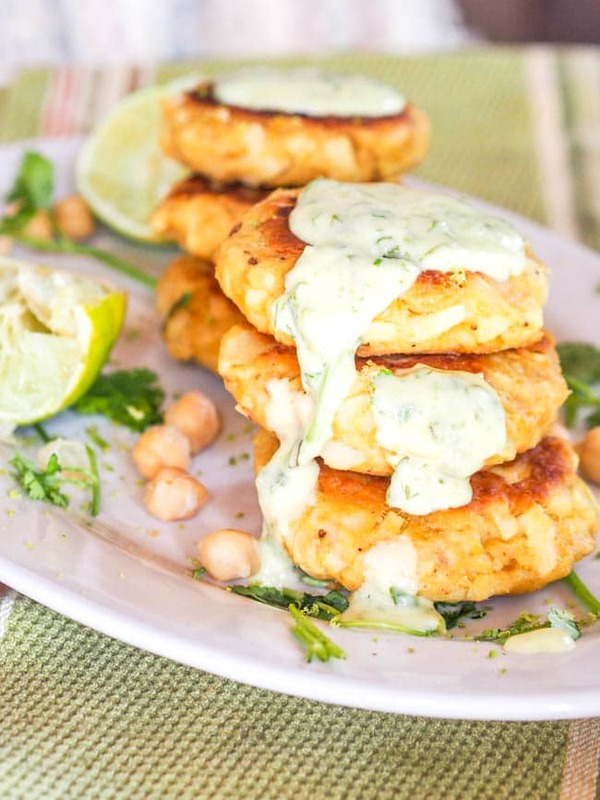 Love that Cilantro Lime Aioli for these salmon cakes. Beautiful dish for entertaining too! This sounds delicious! I love hearts of palm. You can get them at trader joe’s too. I like how you’ve used the, to give the texture of crab! Thanks! Hearts of palm are seriously my new favorite ingredient – I’m adding them to everything! I love hearts of palm and this was such a good idea! Wow! These look delicious! I have never thought of putting heart of palm in a salmon burger but its brilliant! Thank you so much for sharing this recipe…i am looking forward to trying it! Thanks! They’re so good in salmon burgers – you’ve got to try these! Wow this sounds SO great. I actually JUST bought a can of salmon too, so I am totally trying this. Thanks for sharing! PINNED. Perfect timing then to make this recipe : ) Thanks for sharing! Just made these for dinner and they were amazing!!! The aioli was a fantastic addition as well. Mine were a bit crumbly once cooked though. Any suggestions – an extra egg, cooking lower and slower? Curious as I definitely want to make these again!! So glad you enjoyed these! The aioli might just be my favorite part! Adding an extra egg could definitely help or a bit of breadcrumbs, flour, etc. Making sure the salmon and hearts of palm are thoroughly drained too. I’ve also found freezing the formed cakes for 10-30 minutes can help them stay together during cooking too.